As time goes on, we are being asked more and more to complete Exchange 2007/2010 migrations to Exchange 2013, below is a guide I have found that will work you through doing exactly that. Install the hotfix 2550886 for DAG failover improvements on Exchange 2010/2007 DAG servers. Login to the Exchange 2010/2007 server with Schema Admins, enterprise admins, domain admins and organization management group member id as SP 3 will extend the schema. I would suggest going for Windows 2012 for Exchange 2013 but you can use windows 2008 R2 SP1 as well. Install the windows 2012 server or Windows 2008 R2 SP1 on a new server and join the domain. It can be virtual or physical. Now Microsoft support virtualized mailbox role. Run the windows update and install all the recommended updates. Run the following command to install the required Windows components. Run the following command to load the Server Manager module. Imp: You can directly install Exchange 2013 CU1 as well. If you directly install CU1 then you can skip step 12 – Testing mailbox move without CU1. If you are installing CU2 make sure you are installing CU2 V2. If you are doing new installation then you can directly install Exchange 2013 CU1 which itself is a full setup. You can follow same schema update and AD preparation steps. 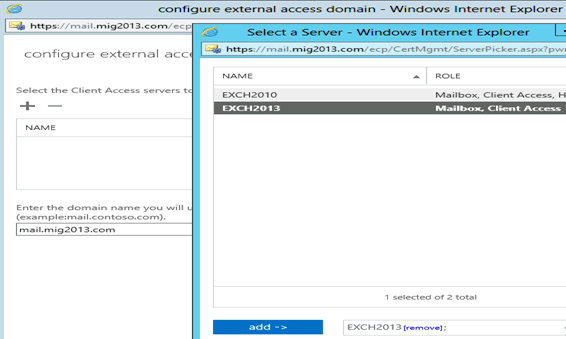 After Exchange 2013 installation the biggest challenge will be how to login to the EAC, there is no mailbox on Exchange 2013. 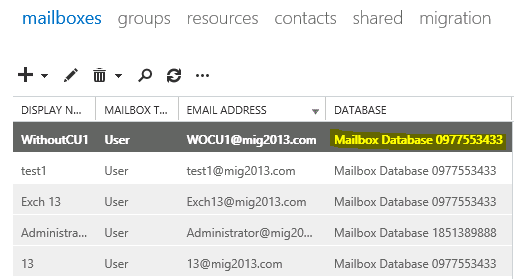 Create a mailbox in Exchange 2013 mailbox database. 4. Give the permission to the mailbox to Administrate EAC. 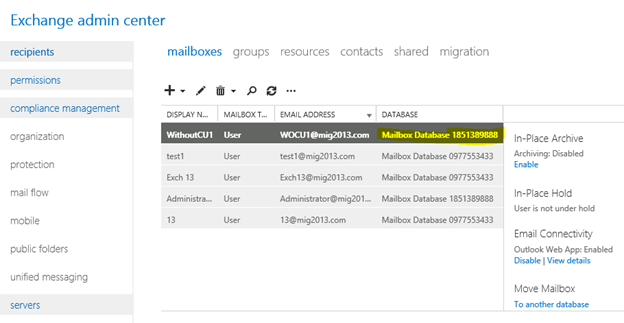 Now I am migrating the mailbox being Exchange 2010/2007 on SP3 and Exchange 2013 without CU1. Now Refresh and you will see completed depends on the size of mailbox. 1. Exchange 2013 reads exchange 2010/2007 send connector information. 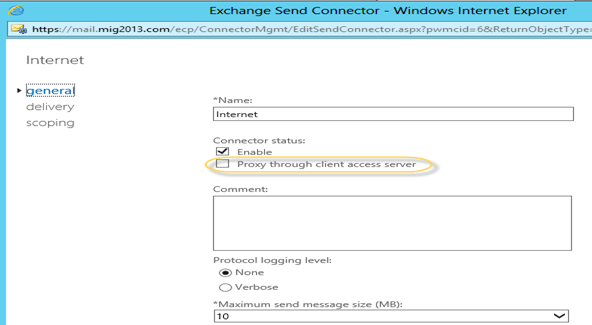 Click on the pencil icon to check and add exchange 2013 in the same send connector. 3. Select the server and add, then click on and save. Send connector configuration completed. 1. 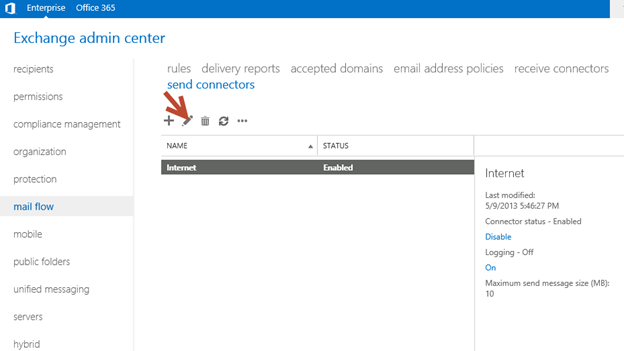 Add a receive connector as per the current connector configuration. 2. Select the 2013 server, oh what we have 5 connectors for what. Let me explain here. 3. You can see all 5 together here as I have CAS and Mailbox on same server. First 3 are for the CAS connector and remain 2 are for mailbox role. Front End Transport service – This service runs on all Client Access servers and acts as a stateless proxy for all inbound and outbound external SMTP traffic for the Exchange 2013 organization. The Front End Transport service doesn’t inspect message content, only communicates with the Transport service on a Mailbox server, and doesn’t queue any messages locally. Transport service – This service runs on all Mailbox servers and is virtually identical to the Hub Transport server role in previous versions of Exchange. The Transport service handles all SMTP mail flow for the organization, performs message categorization, and performs message content inspection. Unlike previous versions of Exchange, the Transport service never communicates directly with mailbox databases. That task is now handled by the Mailbox Transport service. The Transport service routes messages between the Mailbox Transport service, the Transport service, and the Front End Transport service. Mailbox Transport service – This service runs on all Mailbox servers and consists of two separate services: the Mailbox Transport Submission service and Mailbox Transport Delivery service. The Mailbox Transport Delivery service receives SMTP messages from the Transport service on the local Mailbox server or on other Mailbox servers, and connects to the local mailbox database using an Exchange remote procedure call (RPC) to deliver the message. 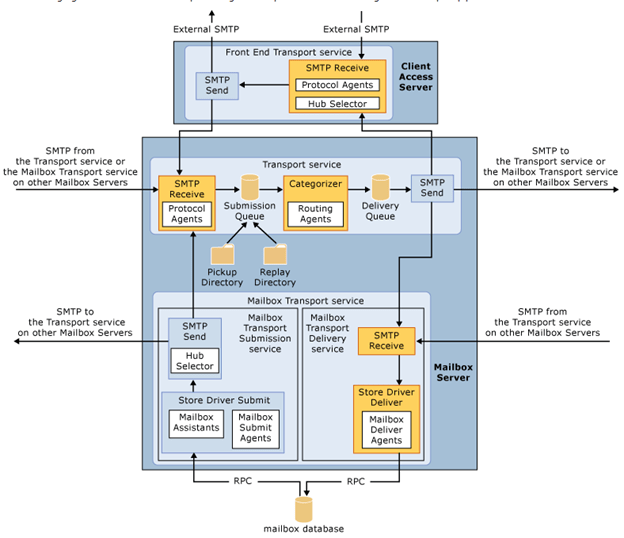 The Mailbox Transport Submission service connects to the local mailbox database using RPC to retrieve messages, and submits the messages over SMTP to the Transport service on the local Mailbox server, or on other Mailbox servers. The Mailbox Transport Submission service has access to the same routing topology information as the Transport service. Like the Front End Transport service, the Mailbox Transport service also doesn’t queue any messages locally. 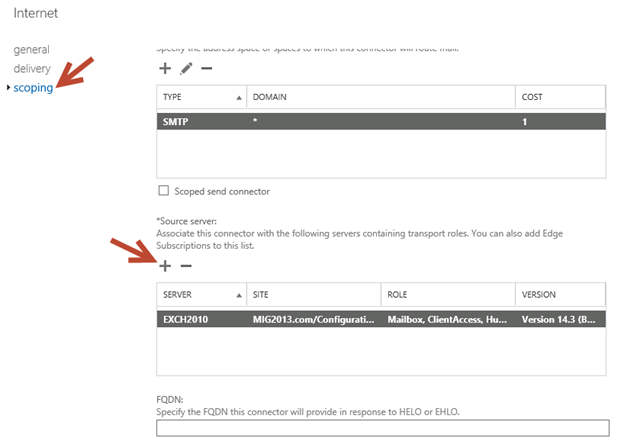 Default Accepts connections from Mailbox servers running the Transport service and from Edge servers. Client Proxy Accepts connections from front-end servers. Typically, messages are sent to a front-end server over SMTP. Default FrontEnd Accepts connections from SMTP senders over port 25. This is the common messaging entry point into your organization. Outbound Proxy Frontend Accepts messages from a Send Connector on a back-end server, with front-end proxy enabled. By default we don’t route the outgoing email to CAS. If we have some mailgaurd or compliance requirement on a separate CAS server then we can use it. If we have CAS and mailbox role on the same server then we don’t need to configure this connector. We can simply disable it. Client Frontend Accepts secure connections, with Transport Layer Security (TLS) applied. 7. You might need to check email address policies, this might needs to re-apply. If we have more than 3000 mailboxes then it is suggest applying from EMS. Configure the external url. This is very simple in exchange 2013. You don’t need to go to every virtual directory property. 5. Then this wizard will open, select the exchange 2013 server and give the external url and save it. 6. CAS Authentication will be “Use form-based authentication” on both Exchange 2013 and Exchange 2010/2007. Now you will see every directory got the same External url. 8. Switch namespace to Exchange 2013 CAS or Exchange 2013 CAS pool load balancer. This can be simply done by changing SNAT internal IP from Exchange 2010/2007 to Exchange 2013. 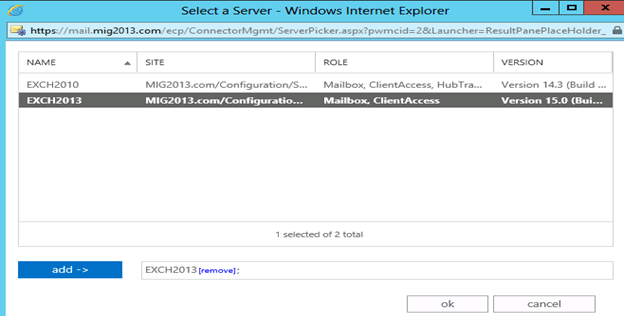 Also Point the internal mail and autodiscover IP to Exchange 2013 CAS server/load balancer. 9. Time to test OWA connectivity from internet. 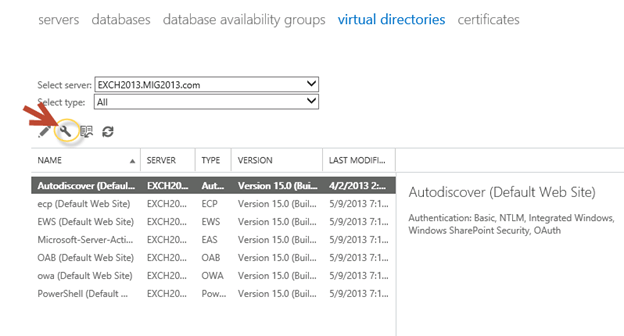 At this time I am able to access owa for the users in both Exchange 2013 and 2010. I am also able to send and receive then emails. We would like to configure a DAG for high availability with multiple databases. So we have 2 options. Follow the below steps to move all arbitration and discovery search mailboxes to final 2013 database. This is the optional step only for unified messaging configured organizations. Default Offline Address List (Ex2013) can be replaced by your custom named OAB. Run the below cmd in EMS to allow auto forwarding, oof, auto reply and disable the possibility of winmail.dat from domino server. If you have pop3/imap4 users then you might like to configure 2013 for some addition configuration. 2. Start the services and change them to automatic. You might need this step if you organization was initially created on Exchange 2003. 1. Create a new email address policy if there is only one “Default Policy”. 3. If you see the below error for the default policy then Remove “Default Policy” which was created in 2003 and will be in ready only mode in Exchange 2013. When you remove default mailbox database, it does not remove health mailboxes which we can check by running the cmd and below warning will come. Health mailboxes are for the health service and they are specific for every database so we don’t need to move them rather we need to remove them. Mailboxes/HealthMailbox94863fe5394447619ec45c4e6b2dd971 has been corrupted, and it’s in an inconsistent state. The following validation errors happened: WARNING: Database is mandatory on UserMailbox. Important: At the point configure your outlook for Exchange 2007/2010 mailbox and 2013 mailbox. If both are working from Internet then move to the next step. Now it is the time to do cut over means point the connections to Exchange 2013. It can be done in few simple steps. 1. 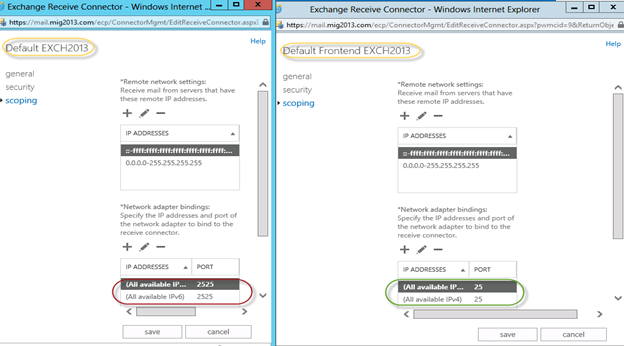 Create or change DNS pointers to Exchange 2013.
mail.domain.com Change the IP from Exchange 2010/2007 to Exchange 2013 CAS servers or Load balancer. Legacy.domain.com this host record is only required in case of exchange 2007 co-existence. This will point to Exchange 2007 CAS servers or lad balancer. 2. Point your Spam Guard to forward all the emails to exchange 2013 to receive incoming mail via Exchange 2013. 3. Configure Spam Guard to accept emails from all Exchange 2013 Mailbox servers. So what are we waiting for… Let us begin the mailbox migration. Once we complete all mailbox migration then we can start the Public Folders migration. Test everything working and shutdown Exchange 2010/2007 server for 1 production week and observe if no issue reported then go ahead with the Exchange 2010/2007 removal process. Now we are in a position to remove exchange 2010. We can follow the below link for the exchange 2010/2007 removal. Great, thanks for sharing the helpful these step to migrate exchange 2010/2007 to 2013 and migrate the entire or selected mailbox data to Exchange Online from your Exchange server. But I tried the automate exchange migrator tool from http://www.lepide.com/exchangemigrator/ that provides the facilitate to migrate to-and-fro between exchange server and complete migration including all or chosen items of user mailboxes and allows to migrations of Intra-forest and cross forest exchange server.